Love it or hate it, Microsoft Windows is the world's most dominant operating system. But when you look at some of the hot features found in competitors such as Linux and Mac OS X, both XP and Vista can seem a little incomplete. From intuitive interface features like Apple's application dock and Cover Flow to basic media capabilities such as ISO burning, Windows often falls short on built-in goodies. And some features that other operating systems offer by default-- such as 64-bit processing and business-networking tools--require a premium-version license in Windows. We took a good look at a variety of OSs, from the Mac to Linux to PC-BSD and beyond, and we rounded up a list of our favorite features--few of which come standard in any version of Windows. We even considered some operating systems of yore, and recalled a couple of cool features that Microsoft still hasn't caught on to. Some of these features simply aren't available for Windows at all, owing to the way the OS is designed. But you can add most of them to XP or Vista with the help of third-party applications, and we'll show you how to get them. 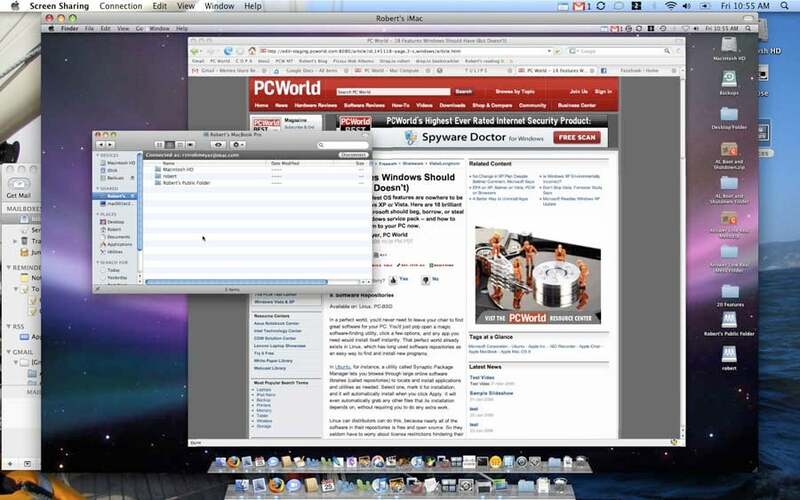 With a single keystroke, Mac OS X's Expose feature brings all of your program windows into view. It's an elegantly simple idea, and it has been available on the Mac since 2003. When you want a clear view of all the application windows that are open at any one time, you just press F3, and a ittle feature called Expose arranges them all as thumbnails spread neatly across your screen. Click one, and it pops to the front while the rest snap back into position behind it. With the release of Windows Vista, Microsoft deployed a feature called Flip3D that attempts to simplify window management in a slightly different way. Flip3D lets users flip through three-dimensional renderings of whatever windows are open on the desktop, but it doesn't offer nearly the same instantaneous visibility that Expose does. Fortunately, a few downloads can add Expose-like thumbnails to your Windows machine. One little tool called iEx for Windows does the trick for free; but the installation is a little awkward, as you have to drag the downloaded files into the correct folders on your PC. A more refined program, TopDesk, installs automatically in XP and Vista--but it will set you back $20 after the 14-day free trial. Linux users have long enjoyed the freedom to keep large numbers of applications running simultaneously--without being overwhelmed by screen clutter--thanks to the power of virtual workspaces. In a typical Linux installation, at boot time four workspaces spring into existence automatically, signified by a little map on the control panel in the corner of the screen. As the user opens more programs, thumbnail icons of them appear in the workspace switcher, indicating which program windows are running in each workspace. To change workspaces, the user simply clicks the appropriate area on the workspace switcher or uses a keystroke combination such as Shift-Right Arrow to move between them. With multiple workspaces comes the ability to organize the Linux desktop environment by task, by application type, by priority, or any other way you care to slice it. It's particularly handy for keeping a handful of applications out of sight and out of mind, without having to shut them down. For instance, I like to keep my messaging and communications apps in a separate workspace from my document-creation programs as a way of staying focused while I work. 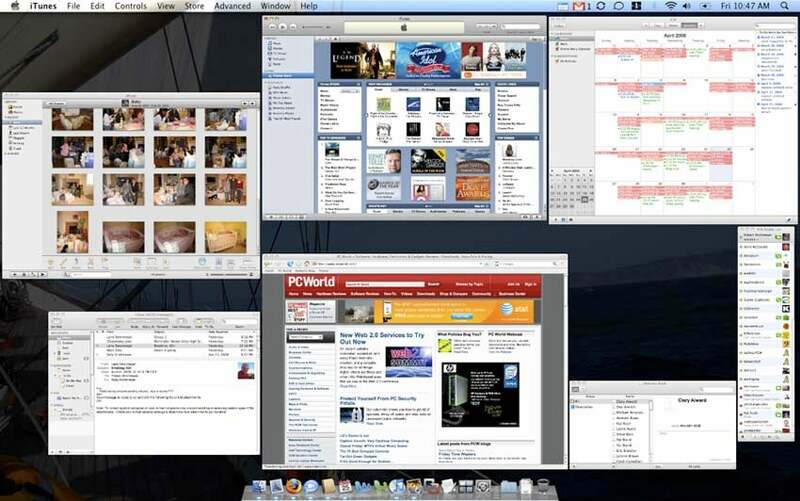 Virtual workspaces, such as these in Apple's Spaces feature, make organizing your PC desktop easy even when you have lots of applications running at once. 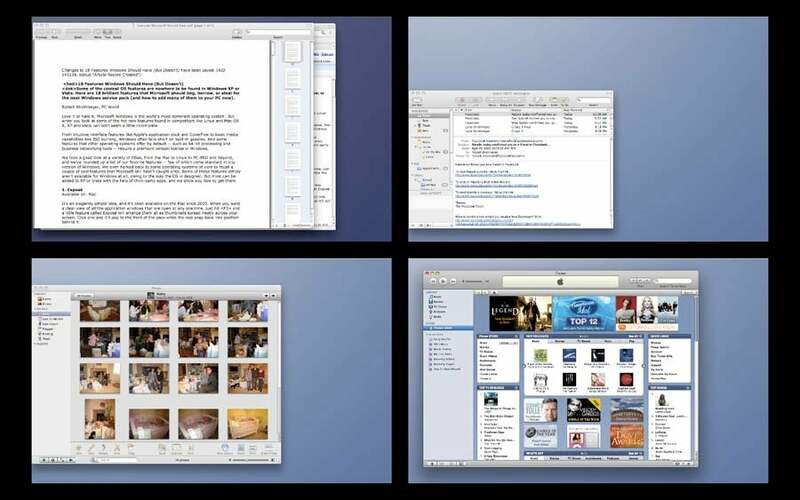 Apple added this concept to OS X with the launch of Leopard in October 2007, although Leopard's Spaces feature lacks dynamic thumbnails (something its Linux forebears offer) in the Dock icon. To get workspaces on Windows, however, you'll have to do some downloading. XP users have an easy solution with the Microsoft Virtual Desktop Manager, a free download from Microsoft's PowerToys collection. For Vista, you must turn to one of several third-party utilities. My favorite among them is a freebie called Dexpot, which offers a wide variety of configuration options. Forgot something back on your home computer? Back to My Mac lets you control that machine from any Mac running Leopard. Nothing quite matches the feeling you get when you sit down at your office desk, boot up your PC, and realize that the most recent version of the document you've been working on is stranded 50 miles away on your home machine. If both of your computers were Macs running Leopard, you could use Back to My Mac (coupled with Apple's $99-per-year .Mac service) to fire up a connection to the remote computer, grab whatever files you need, and even navigate the other machine's desktop as if you were sitting right in front of it. If either of your PCs are running Windows, however, all the .Mac accounts in the world won't help you. Instead, try GoToMyPC. At a base price of $20 per month ($180 per year) for one PC, this service ain't cheap. But it does give you unfettered access to your Windows computer from any Web browser.